Assessment, Learning, and School Improvement, Ed.D. MTSU’s doctorate in Assessment, Learning, and School Improvement became a reality after more than forty years of working for a program that focuses on improving K-12 teaching and learning. This unique program is designed to meet a specific need to develop capabilities of existing school leaders, in formal and informal leadership roles. The program offers research-based knowledge, analytical skills, and practical application to enhance student learning, increase assessment scores, and improve schools. This is not a program you learn about now and do some day; in the ALSI program you will integrate your learning directly into your setting in a job-embedded professional development approach. Educators who want to make an immediate difference in the lives of K-12 students are attracted to the program and the opportunity to participate in projects that result in direct improvements. The cohort-based doctoral program provides a structured curriculum that takes into account that most students are employed during their studies. Participants benefit from the support and collegiality of their cohorts. Tracy Hollinger was in her fourth year as principal of Northeast Middle School when she decided she could balance the time, commitment, and work load of her demanding job and the stress of pursuing a doctorate. “I was leading others, but I was certainly feeling the need to challenge myself and grow in my own knowledge and skills as an instructional leader,” she recalls. When she looked at doctoral programs, she discovered that MTSU had a new program in Assessment, Learning, and School Improvement. 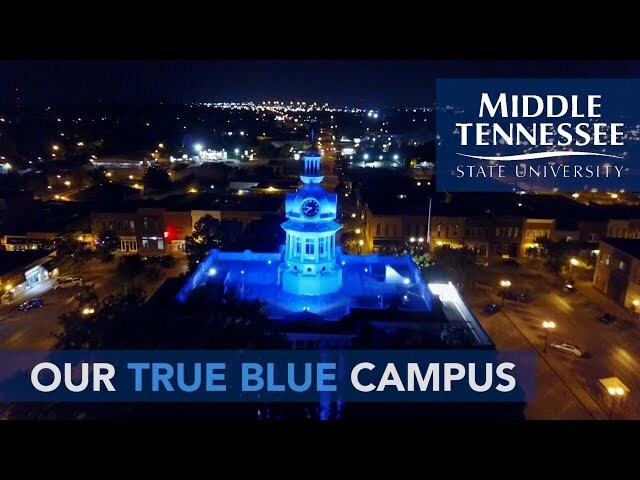 “Having received my bachelor’s degree at MTSU, I knew firsthand the quality of the education programs. The ALSI program was exactly what I was looking for—designed from current research, focused on job-embedded application, and with a distinct focus on student learning and school improvement.” Hollinger says the program impacted her daily work “in profound ways,’ such as the utilization of new resources and processes for examining progress, needs, and strengths in developing a school improvement plan. “I highly recommend this program for those interested in expanding their knowledge and skills, examining current educational research, and exploring new ways to impact instruction and learning in all levels and roles,” she concludes. The Ed.D. in Assessment, Learning, and School Improvement is designed to meet a specific need to develop the capacity of existing pre-K–12 school leaders (including teacher-leaders) and those in education-related careers to significantly improve student academic achievement and to meet increased accountability mandates. Program graduates may also find work in higher education, research, educational policy, governmental agencies, not-for-profit and philanthropic organizations, and professional development consulting, which will also contribute to improved student and school achievement. Because this degree program is new, employer information is still being compiled. The College of Education began offering the Doctor of Education (Ed.D.) degree in Assessment, Learning, and School Improvement (ALSI) in 2013. Following are a few key points to help answer initial questions. The ALSI program is a cohort-based program comprising 60 graduate credit hours. The ALSI program is partnering with districts to offer cohorts based out of their districts to meet practitioners where they are and ground learning in real context. This doctoral program requires the physical presence of all cohort members for all class sessions. The ALSI Ed.D. is not an online doctoral degree program. All applicants must have successfully completed an earned master's degree from an accredited institution prior to admission. The ALSI program will admit applicants based on a competitive process including but not limited to a professional portfolio, an onsite personal interview, and the Graduate Record Exam (GRE). The program will take advantage of the latest technology to enhance the learning opportunities for all of the learners in the program. We will engage as a cohort of faculty and learners to model the development and growth of an authentic learning community. Completion of the degree requires successfully completing all courses as prescribed in the ALSI program course of study, conducting original research, and successfully completing a doctoral dissertation, among other graduation requirements. The College of Education also offers a Doctor of Philosophy (Ph.D.) in Literacy Studies. This degree will provide educational leaders with the knowledge and analytical skills to analyze all forms of student-learning data (formative and summative, quantitative and qualitative) in order to accurately identify areas of success as well as areas in need of specific attention to attain school improvement. Applicants with a leadership role (including school administrator, teacher-leader, policy-maker, policy advisor, staff in philanthropic and not-for-profit agencies, higher education,and educational consulting) in PreK-12 education and a master's degree in a variety of disciplines are eligible for admission. Typically, successful students will hold formal qualifications related to some area of PreK-12 educational practice with three or more years of professional experience in their specializations. Applicants are expected to have a minimum grade point average (GPA) of 3.50 in master's coursework. Applicants are expected to have scores on the Graduate Record Examination (GRE) that indicate capacity for success in doctoral study. All application materials must be submitted to the College of Graduate Studies. NOTE: The program is partnering with local school districts for off-campus cohorts. Please contact program office for current procedures pertaining to location and deadlines. submit three letters of recommendation which must meet the following specific criteria.The first letter must be from an educational leader (principal, assistant principal, central office administrator, school board member) of your school or school district and should specifically address: (a) your abilities, and (b) their support for you to lead an effort to significantly improve student learning and achievement in your current position. The second letter must be from a tenure-track professor, and it should address your potential to successfully complete an academically rigorous doctoral program. The third letter may be from any educational professional (i.e. : LKPreK-12 education leader, university faculty, policy maker, governmental agency representative, non-profit or philanthropic organization leader, etc.) and should address your specific skills, attitudes, and experience(s) related to the goals of this program. participate in an interview with the Assessment, Learning, and School Improvement doctoral program admission committee as part of the admissions process. NOTE: Accepted students will be required to attest to their commitment to the cohort and to contribute the necessary quality and quantity of time and energy to ensure the success of this community of learners as each student prepares to lead an effort to significantly improve her/his school or school district. NOTE: International students will be required to meet MTSU's English language proficiency requirements in addition to the program admission requirements. successful defense of a dissertation that demonstrates mastery of applied research methods in the field of education. Provides thorough knowledge base in research on ties between instructional practices and students' learning and achievement. Examines cognitive learning theory from learner perspective and draws on newest research on the best classroom and school cultures to support student learning and achievement. Examines research on importance of a guaranteed and viable curriculum tied to state and national standards as well as the skills needed by school leaders to develop, implement, monitor, and evaluate this type of curriculum. Examines research base of instructional practices proven to have direct, positive correlation with improved student achievement. Links this research base to national initiatives and teacher evaluation models aimed at improving teaching experience. Equips students with skills to promote adult learning. Focuses on providing students with in-depth knowledge about research behind the concepts of teacher observation, evaluation, and improvement methods as well as applied skills in implementing these evaluative methods, with an emphasis on using these methods to improve instructional practice and ultimately student achievement. Provides students with structure and format for reflective practice regarding student learning, including application of research knowledge base to challenges faced in K-12 educational settings. Prerequisite: One undergraduate statistics course or permission of instructor. Provides students with knowledge and skills needed to understand, interpret, and apply appropriate statistical methodologies and concepts to the educational settings. A survey course for basic statistical methods, including descriptive statistics, confidence intervals, sampling, distribution, Central Limit Theorem, logic and procedure of hypothesis testing, z-tests and t-tests of means and proportions, chi-square tests, correlation and simple regression, and one-way ANOVA. Statistical software packages such as SPSS and SAS will be utilized for data analysis. Prerequisite for ALSI 7620 and ALSI 7630. Provides candidates with a thorough understanding of cognitive learning theory in order to inform best instructional practices on behalf of diverse learners. Framed by a collaborative team approach within a school community. Prerequisites: ALSI 7600 and ALSI 7610. Provides students with advanced quantitative research methodologies that can be applied in an educational setting. Topics include power and effect size, ANOVA (One-Way Analysis of variance, Two-Way Analysis of Variance), MANOVA (Multivariate Analysis of Variance), ANCOVA (Analysis of Covariance), Factor Analysis, Multiple Regression, Logistic Regression, and ranking or Non-Parametric tests. The Statistical Package for the Social Sciences (SPSS) will be used. The course will include the study of the methodologies used in growth models. Prerequisites: ALSI 7600 and ALSI 7610. Provides students with advanced qualitative research methodologies that can be applied in an educational setting. Course content focuses on conceptual issues, ordering, framing inquiry, applying appropriate approach and design, selecting and collecting data, approach-specific analysis, interpretation of data, and reporting procedures. Course tasks provide opportunities to develop skills in qualitative coding, bracketing, restorying, descriptive culture sharing, and cross-case theming. Focuses on assessment vocabulary and practices prevalent in North America and Tennessee. Appropriate use and interpretation of various types of formative and summative assessments, both norm-based and criterion-referenced. Engages students in comprehensive study of conceptual and applied aspects of assessment with a focus on the role of assessment in improving student learning. Students will focus on specific skills in developing and using assessment to influence student achievement and school improvement. Emphasizes the development and use of collaboratively developed, common, formative assessments for improving student achievement. Examines both the research basis behind and applications for developing multiple kinds of formative assessments and for collaboratively analyzing their results. Provides students with a deep understanding of the interplay between and the connection of multiple assessment tools, data analysis, improved student learning, and school and district improvement with an emphasis on linking student achievement data to decision-making for improving student learning at every level. Provides students with structure and format for reflective practice regarding the assessment of student learning, including application of research knowledge base to challenges faced in K-12 educational settings. Examines the research base related to the cultures and practices that characterize highly effective schools and school districts. Stresses the process skills educational leaders need to be change agents and to apply research findings to specific educational settings with an emphasis on developing consensus for substantive change. Examines the research base related to professional learning communities and their link to greater student learning and school improvement. Focuses on skills required for successful implementation of professional learning community concepts and practices at all levels to create a culture of continuous improvement. Provides students with the importance of collaborative teaming in order to impact student learning and implementing the best instructional practices. Examines the research base on best practices as well as applications for improving student achievement in specific core curricular areas (emphasis on math and literacy) and among specific subgroups (emphasis on children with disabilities, children of poverty, and children whose primary language is not English). Applies this knowledge base to designing timely, directive, and specific systems of intervention. Provides students with structure and format for reflective practice regarding research-based school improvement, including application of research knowledge base to challenges faced in K-12 educational settings. Selection of a research problem, review of pertinent literature, collection and analysis of data, and composition of the dissertation. Once enrolled, students must register in at least one credit hour of dissertation research each semester until complete. Open only to students who are in the Assessment, Learning, and school Improvement Doctor of Education degree program. S/U grading. Currently, the program admits students in successive cohorts. All students in the graduate program are expected to complete all coursework with their cohort as scheduled.